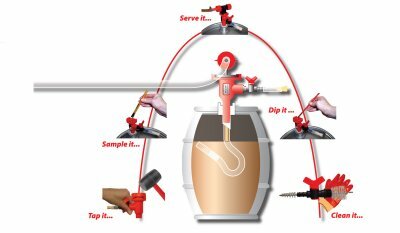 The Cask Widge is an upright dispense system that has a flexible pipe with a floating filter attached that draws the beer from near the top of the cask. The floating filter (Float Head) sits below the "top break" and follows the beer down until it reaches the bottom of the cask. By taking beer from below this sub-surface layer, any oxygenation and contamination is prevented from spreading down into the beer below, keeping the beer in its best condition. The space and labour savings, ease of use, and cost benefits allow all publicans, even those constrained by cellar space, the chance to offer real ales at the bar or even now under the counter. To view a video demonstrating the Cask Widge click here. #40185 Red "L" Piece for single beerline connection. #40176 CaskWidge Float Red. 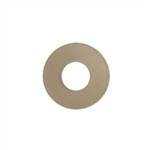 Replacement Float Head for CaskWidge Float. 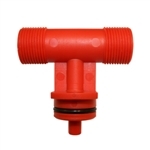 Made from FDA approved materials and contains a fine gauge mesh filter. #40175 CaskWidge Float Tubing 9-11 gallon. Everything you will need to tap, vent and condition a cask waiting to go on-line. To use with a firkin cut tubing to 22 3/4 inches. This is tubing end to end not including float head. Like the single plus the equipment to enable you to tap, vent and condition another cask to be ready to go online. Note: For pin cut tubing to 17 1/2 inches.